Funnily, sometimes best flavored dishes are produced under pressure. Here is one that turned out really good, colorful, healthy and clean, perfect for wintery days. Few Asparagus, if you have any. Or any add any vegetable of your choice like onions also taste very good. Julienne the vegetables into 1/2 inch thick long strips, all same size. Toss them with olive oil, generously. Sprinkle salt and pepper, toss again. 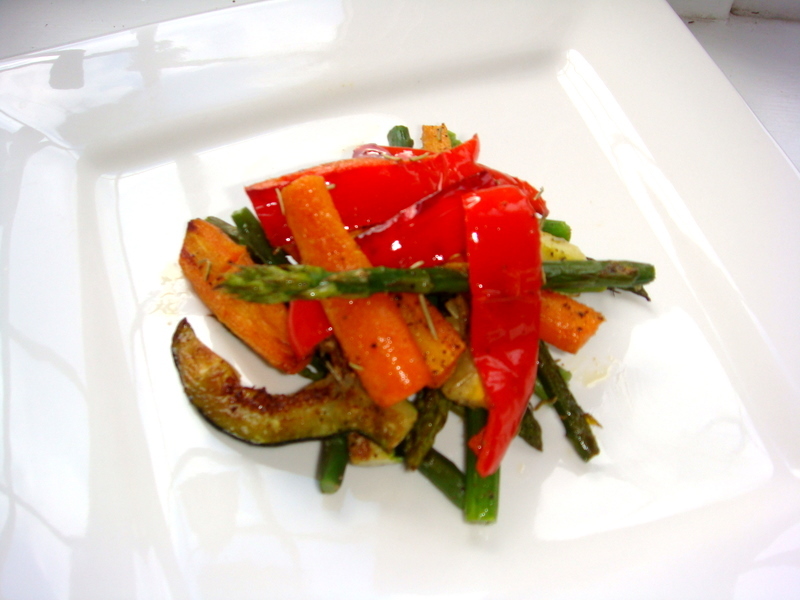 Oven roasted vegetables are so aromatic, do not need any frying or excessive cooking and they taste so good!!! Spread them on a bed of pasta, toss them in a salad or eat just like that with a bowl of soup!!! A fabulous asian dish with spicy coconut curry base,noodles and vegetables. The original dish uses shrimp and chicken, this vegetarian version is equally delicious and wholesome. 1 cup each of boiled, diced fine, potato, green beans and carrots. 1 medium size onion, 4 cloves garlic, 2 table spoons of besan or 1 tsp of corn flour + 1/4 cup water. A few green chillies diced very fine. Green chillies, lemon juice and coriander chopped, for garnishing. Loaf of french or Italian bread to go with it, sliced. Saute the onions in oil until golden, then add minced garlic, 2 tbs besan. Saute again for a few mins until the besan is lightly cooked. If using corn flour mix, then add that to the coconut milk. Make individual servings, this dish cannot be pre-assembled for a group. In a bowl, put one or two slices of bread, ladle the veggies, noodles and pour the curry. Garnish with diced green chilies and lemon juice and coriander leaves.